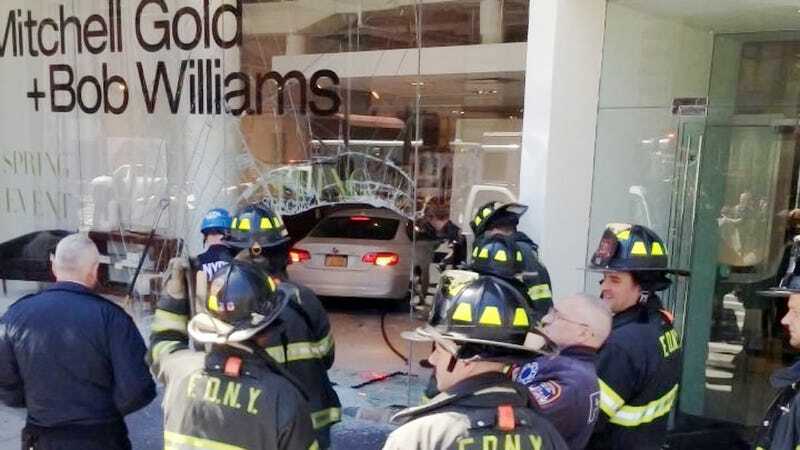 Until a Bentley breaks through the wall of Saks Fifth Avenue, this BMW careening into a flagship furniture store in SoHo will be the most luxurious crash in New York City this year. There were no apparent serious injuries caused by this white BMW 328 x-drive coupe (starting at $40,400) crashing into Mitchell Gold + Bob Williams' flagship store on One Kenmare Square, SoHo. The beautiful spring sun glittered on the broken glass as fashionable tourists and well-to-do socialites strolled past, pulled out their iPhones and asked, "Did a car crash through here?" Indeed one did. The BMW coming from Long Island failed to make the turn onto Lafayette Street heading towards the most prestigious sections of SoHo and downtown. The owner did not speak English, but an older relative or companion with him relayed his description of what happened. "I guess he realized the corner was a little sharp and he couldn't stop in time," the older man stated. He was apologetic about the crash but did admit that the car was fully insured and he believed the store was covered as well. At the scene of the accident, women in sharp cut pants and interesting blouses continued to peer out at the wreckage from behind their designer sunglasses. The damage in the store was remarkable. What appears to be a 90" sofa from the Martin Upholstered collection (retail price $1,325) was knocked completely through a wall holding a sepia-tone large-scale photograph of a horse. Another large piece of furniture had been thrown onto the sofa as well as what looks to be a Power Shag rug in "Ink" (retail price formerly $2,395 now available for $1,916). It is unclear what the large piece of furniture is, as it clearly does not go with the nearby set, according to Jalopnik interior decoration experts. The car itself is in thoroughly bad shape. In addition to the crunched bumper, headlight, and door panel, you can see above that the front driver's side wheel is bashed completely out of line. The optional four-wheel-drive system equipped on this vehicle did not keep the car from pushing wide, hitting the curb, and flying all the way into the side wall of the store. The final impact is noted here in pink. A first-person witness, dressed in a very charming multicolored dress made of a lovely thick fabric, showed us images and a brief video she took on her iPad. She had arrived before the police. "I didn't know what was going on," she described her initial reaction. "So I took a picture." Her boyfriend was more blase. "I couldn't care less." The police on the scene were just wrapping up the proceedings around 2:30, an hour after the crash occurred. They had no official statement. As finely made-up people filtered past, they exchanged words on the crash and saved up pictures and stories for later, perhaps to be told over lightly colored martinis at some leatherlined Chelsea lounge. It was clear that this BMW crash was the place to be in SoHo today.